FeedBeater is a Web service that allows you to generate an RSS feed from any Web page. FeedBeater is one of the best online service I came across which are useful to create RSS feeds or email alerts for any webpage on the Internet. It is also possible to configure FeedBeater to alert you as soon as a change was made to a Web page. 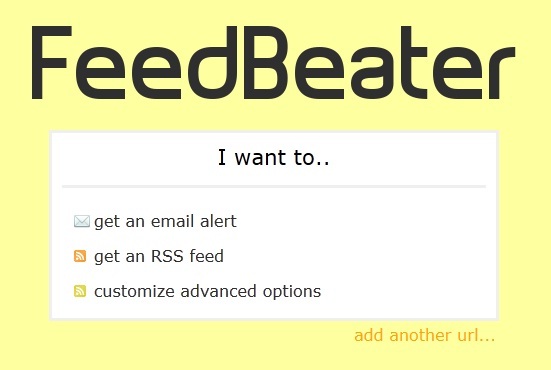 The process is quite simple, All you need to do is to visit the FeedBeater website, enter the website name or page url that you want to receive updates for, and select if you want RSS feed updates or email alerts. As simple as humanly possible :Enter a URL. Get a feed. Zero configuration and zero steps in between, unless you want to. Full Content :Unlike some other tools, it’s not just the links or the text that will appear in your feed, but the full content, as if it was clipped right out of the page, including any images or video. Reliability :FeedBeater doesn’t rely on matching hard-wired patterns, so your feeds keep working even when the page you are following gets redesigned. Ability to Customize :For those times when you need more control, FeedBeater lets you restrict by keywords or regions of the page. FeedBeater offers more options than its competitors. In addition to generating an RSS feed for any web page, you can set up notifications by email. They are transmitted as soon as an update is made to a Web page. It is even possible to restrict the alerts to certain words or areas of a Web page. With a few clicks, you select the words and areas you want to add to your day. Both options can be used to fine tune the notification settings of the RSS feed creation and email alert option. So If you have a URL that you would like to syndicate, FeedBeater will beat the RSS out of it.